Nestled in the heart of North Naples, Deep Lagoon Seafood is a place just off the beaten path where fresh fish is delivered daily by their local fishing partner Island Crab Company, based out of Pine Island. The Puma family, owners of Pinocchio’s Original Italian Ice Cream expanded their offerings with the opening of this gourmet croissant bakery offering Grab and Go Beach Cuisine. elegant surroundings, accompanied by beautiful vistas while cruising the bays and out into Gulf of Mexico. 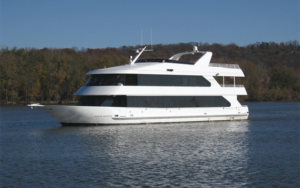 Their schedules include a choice of a Seabreeze Lunch Buffet Cruise, a Sunset Hors d’oeuvres Cruise or their Sunset Dinner Cruise and you’ll enjoy a delicious meal prepared fresh daily, right in their own galley. 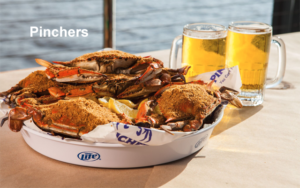 Known as The Gulf Coast’s Largest Stone Crab Cracking Facility, the best the Gulf has to offer are harvested by local fisherman from Pincher’s Island Crab Company and delivered daily to their locations. Best of all, Stone Crabs are a renewable resource! 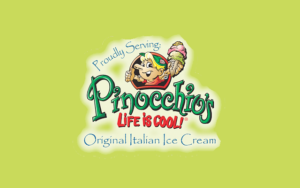 Pinocchio’s Original Italian Ice Cream is a Sanibel tradition since 1980. They serve up their unique handcrafted frozen confections that keep loyal fans returning for more to their little green shop on the east end of Sanibel Island. Pinocchio’s serves 37 flavors of their homemade ice creams, gelatos, frozen yogurts, sherbets and sorbets from their repertoire of 130+ original recipes prepared daily in their store from the finest and freshest ingredients. 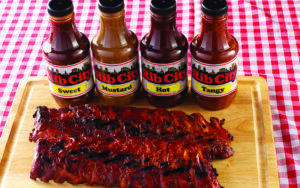 With 11 neighborhood locations in SW Florida, Rib City promises the best Barbecue – and they make good on their promise. Their specialty is real BBQ and great ribs – in fact they are so proud and confident about it that they make a promise to all customers that if you have to use a knife to eat your Baby Back Ribs they will pick up your meal. Award winning restaurants are awaiting you at Seminole Casino Hotel Immokalee with three delicious dining options. 1st STREET DELI is an authentic New York-style delicatessen the only one in Southwest Florida. Get a taste of the big apple and grab a sandwich piled high on the freshest bread, along with crunchy pickles and tasty sides! EE-TO-LEET-KE Grill (The Camp) offers the best dishes Southwest Florida has to offer, including its signature authentic Seminole Fry Bread, fresh-from-scratch classic favorites, certified prime Angus cuts of beef and fresh seafood. And now their menu includes gluten-free as well as organic dishes and is open 24/7. LUCKY MI blends traditional ingredients with contemporary influence with flavors of the far east to put a bold new spin on Asian cuisine now including Sushi. 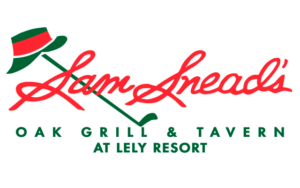 Located in the Lely Golf Resort, you’ll enjoy the view of the famous Flamingo Island Golf Course designed by famed golf architect Robert Trent Jones, Sr. and choose from a wide selection of foods grilled with locally-cured oak, that creates the most unique flavor around. 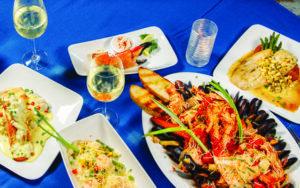 One of the only beachfront restaurants on Sanibel, Traditions On The Beach is the perfect place to enjoy a casual fine dining atmosphere featuring Contemporary Cuisine, Sanibel Style. The bar & lounge restaurant is nestled inside the Historic Island Inn – a Sanibel landmark since 1895. 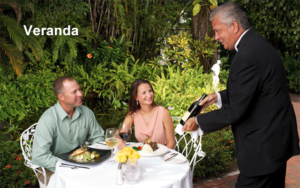 Their romantic setting in two turn-of-the-century homes, combined with Southern Regional Cuisine, an extensive wine list, and first class service staff, will provide you with one of the most unique dining experiences to be had here in Downtown Fort Myers. 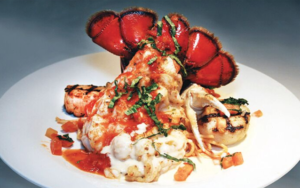 They are consistently honored as one of the most award-winning restaurants here in Southwest Florida.